Get to know the personalities behind the Le Marais experience while learning how to create its incredible delicacies at home. In sections covering sauces; soups; salads; bread, pasta, and risotto; beef; classics; lamb; veal; poultry; fish; sides; and desserts, this beautifully illustrated cookbook gives you the techniques and recipes you’ll need to bring French gourmet into the kosher kitchen (or any kitchen). 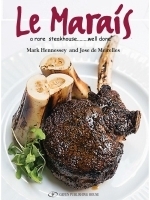 Hip and irreverent, the Le Marais cookbook is your entrée to the world of French cuisine that just happens to be fully kosher. Braised duck legs with white pearl onions and petite pois, anyone?